Help for retrenched workers will come sooner under a new rule that takes effect on Jan 1. They will get guidance earlier on jobs that could suit them and be asked to attend workshops on handling interviews, among other things. The quicker help follows the new rule which requires employers to inform the Ministry of Manpower (MOM) within five days of laying off workers and give details of the employees told to go. It applies to all companies with at least 10 workers, and which are retrenching five or more employees in any six-month period. They must report the move once the fifth worker is notified, and must report every subsequent retrenchment as well. Currently, companies with at least 25 employees report only the number retrenched in the MOM's mandatory quarterly surveys. Employers who flout the new rule will get warnings and, on conviction, could face penalties, including a fine of up to $5,000. 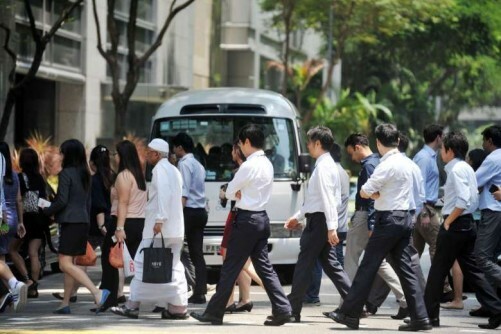 With the long-term unemployment rate creeping up and the rate of re-entry into employment slowing, helping people get back to work is a top concern, Manpower Minister Lim Swee Say said yesterday when announcing the rule. "The sooner employers report to us, the sooner we can reach out to retrenched workers, and the sooner we can put them under employment support," he said when visiting the Lifelong Learning Institute in Paya Lebar. He foresees professionals, managers, executives and technicians (PMETs) being in the majority of those laid off amid the global economic slowdown and economic restructuring in Singapore. MOM's estimates show that 11,890 people were retrenched in the first nine months of this year, up from 8,590 in the same period last year. When the new rule takes effect, his ministry can enforce it by verifying the reported numbers with its quarterly surveys, Mr Lim said. He also said companies need to provide just four personal details on each worker: The NRIC, residential status, job title and retrenchment date. The process is not too onerous for small businesses without big human resource departments, he added. MOM will give the data to a taskforce set up in March this year to help Singaporeans get back to work. The Taskforce for Responsible Retrenchment and Employment Facilitation is led by statutory board Workforce Singapore (WSG) and comprises officers from MOM, the National Trades Union Congress and Employment and Employability Institute (e2i). In the first nine months of this year, a total of 200 companies have reported retrenchments to MOM, and the taskforce has offered help to 3,000 people, said its chairman and WSG chief executive Tan Choon Shian. Of these, about 2,000 asked for career support and about 60 per cent of them were placed in jobs. Mr Tan also said 18,300 job seekers sought help from the five career centres run by WSG and e2i in the same period. Singapore Human Resources Institute president Erman Tan said the rule will also encourage companies to be prudent and look for alternatives to job cuts as they are accountable to MOM. Former senior R&D supervisor Victor Pang, who was laid off in January from the offshore and marine industry, spent several months looking unsuccessfully for job . The 52-year-old landed a job last month as a project manager in the water industry through the Career Support Programme, which helps jobless PMETs. "Seeing what is available at the start of their job search will help retrenched workers know they are not in it alone," he said.